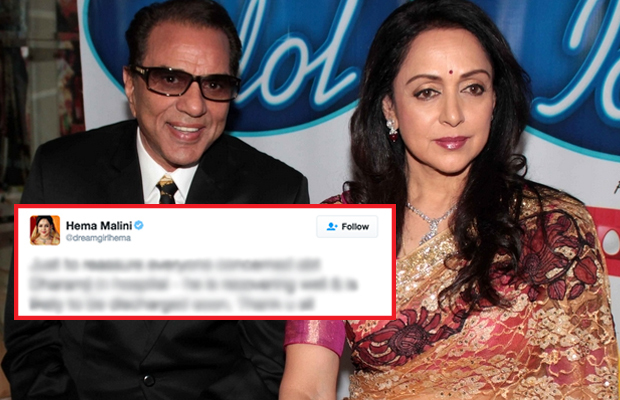 Hema Malini Speaks Up On Husband Dharmendra's Hospitalisation! Home BOLLYWOOD Hema Malini Speaks Up On Husband Dharmendra’s Hospitalisation! Hema Malini Speaks Up On Husband Dharmendra’s Hospitalisation! Hema Malini said that Dharmendra, 81 years old, is recovering well. He was recently admitted to the Nanavati hospital for complaining about pain and uneasiness. Hema took to Twitter and wrote that “Just to reassure everyone concerned about Dharamji in hospital- he is recovering well and is likely to be discharged soon. Thank you all”. Eldest son Sunny Deol also tweeted about his dad that he is down with food poisoning and is recovering fast. ‘ He was said that he is glad about the concern from people but people shouldn’t speculate much about it. Here’s what he tweeted, “Thanks a lot for your concern about my father’s health. He was down with food poisoning and is recovering fast. Please don’t speculate about it”. Well! Now that’s a great news for all the Dharmendra fans out there. Dharmendra, born in 1953 in Punjab’s Ludhiana district, came to Bollywood with 1960’s Dil Bhi Tera Hum Bhi Tere. He is popular for his films like Bandini, Phool aur Paththar, Anupama, Chupke Chupke and Sholay. Previous articleExclusive Bigg Boss 10: Priyanka Jagga To Quit The Show! Next articlePost Eviction From Bigg Boss 10 House, Here’s What Rahul Dev Is Upto!